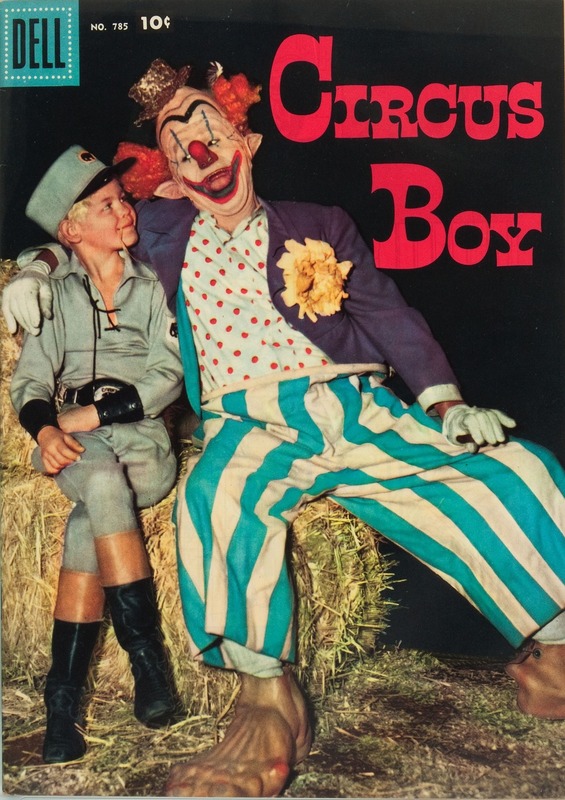 Circus Boy ran in prime time for 36 episodes on NBC in the 1956-57 television season and then 13 more for ABC in 1957-58. It would likely be a mostly forgotten series if it were not for the young star of the show on the left who was then billed as Mickey Braddock. Nine years later, he would be clowning around with three other guys, drop the "e" from his nickname, and using his real last name as Micky Dolenz of The Monkees. Posted in 1950s, Media, Retro/Vintage, TelevisionTagged Americana, clown, comic book, frightening, scary, TVBookmark the permalink. Circus Boy was very popular when shown on BBC TV from 1957, with reruns until 1971. Wow, that is a long time for a show to have been in reruns! I had never even seen an episode until YouTube came along. Thank you for both of your comments! Circus Boy was also shown on a British cable/satellite channel called BRAVO during the 1990s along with other vintage TV shows.